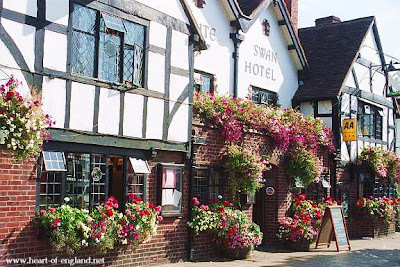 Including a walk around Stratford-upon-Avon, and details of how to Get to Anne Hathaway's Cottage and Mary Arden's House. 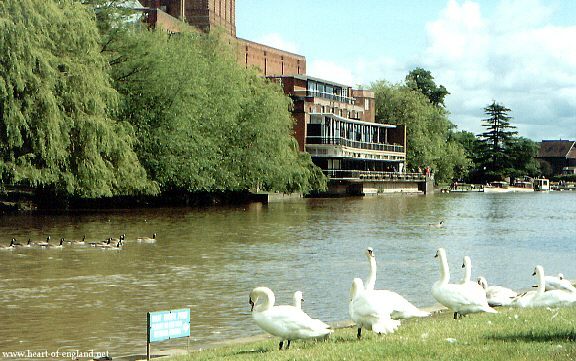 Many visitors to Stratford-Upon-Avon arrive by car. 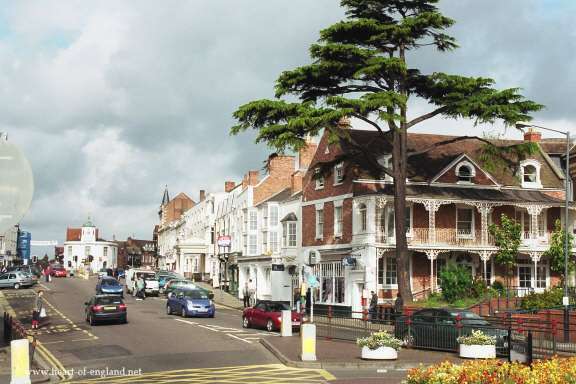 There are two large car parks on the Warwick side of the town, near the river, and well sign-posted just as you enter the town. 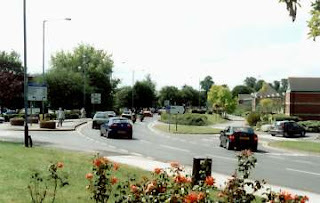 This picture shows the main road into Stratford, which is one-way, and two slip roads, off to the left and to the right, leading to the car parks. The slip road off to the left leads to a large open-air car park, and a coach park. The slip road off to the right leads to the Bridgefoot Multi-storey Car Park. This picture shows the Bridgefoot Multi-storey Car Park. There are toilets on the ground level. 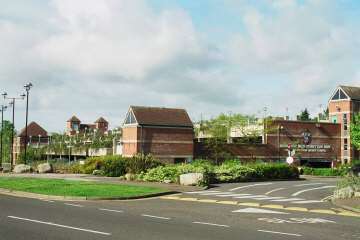 Just beyond the far end of the Multi-storey car park is the Tourist Information Centre. 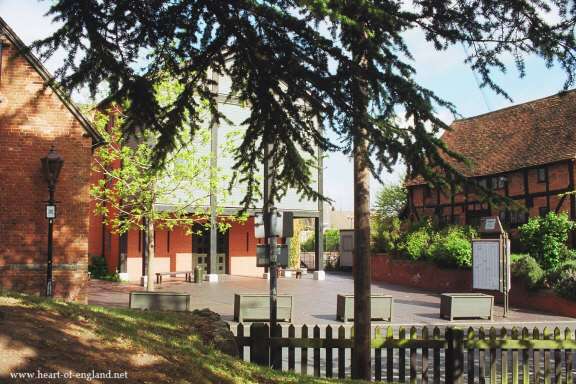 Besides answering specific queries, the Tourist Information Centre has visitors' maps, and a large range of free leaflets detailing tourist attractions throughout Warwickshire. Free bus route maps and time-tables are also available here. How to Get from London to Stratford. If you arrive by train, then a short walk from Stratford Station takes you to the Market Place, about half-way down this page, and you can pick up the tour round the town there. The annotated map at the right shows the path for the walk round Stratford described on this page. 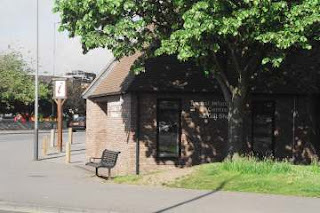 We start from the car parks near the Gower Memorial, then up Bridge Street to Shakespreare's Birthplace. 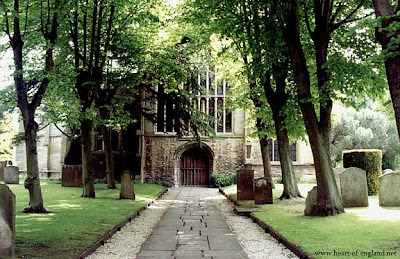 Then back and along High Street, past Shakespeare's former home, and Shakespeare's Schoool, down Old Town Road past Halls Croft, to Holy Trinity Church. There are two alternative routes from the Church back to the car parks: one on the same bank of the Avon, past the Theatre and Canal Basin; the other (shown on the map) crosses over the Avon, and returns through the recreational park. The dotted red line on the map indicates a path to Anne Hathaway's Cottage, which is described as a separate walk: Walk to Anne Hathaway's Cottage. Directly across the road from the Tourist Information Centre is the Gower Memorial. Behind the memorial is the Stratford Canal Basin, the Bancroft Gardens, and the Theatres. 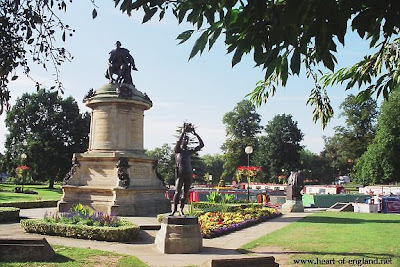 Around each corner of the Gower Memorial are 4 smaller statues of characters from Shakespeare's plays, Prince Hal (shown in the picture above), Lady Macbeth, Hamlet and Falstaff (shown at the left). This is a favourite place for visitors to have their photos taken. 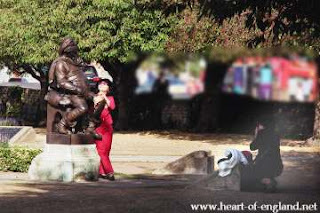 In this picture, one tourist is close to the statue of Falstaff, while her friend, crouching down at the right, takes her photo. There is also a good view from here, looking down the Avon towards Holy Trinity Church. 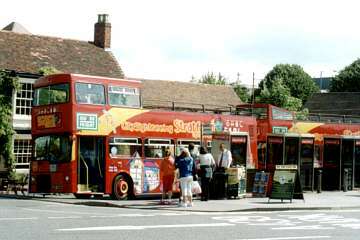 Returning to the Tourist Information Centre, just next to the Tourist Information Centre, is the main departure point for the City Sightseeing Tour buses. There are more details about this tour, and more pictures showing some of the sights you can see on the tour, on the separate City Sightseeing Tour Page. 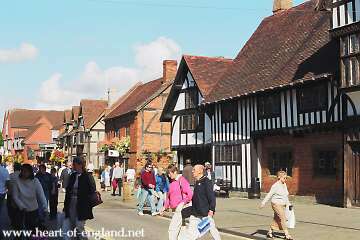 There are also personal conducted tours, on foot, around the town, organised by Stratford Town Walks. 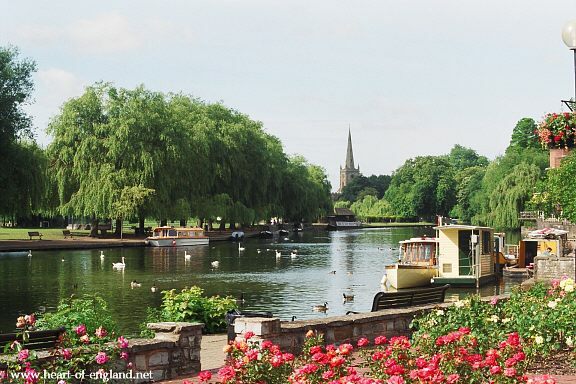 These depart from the Swan Fountain, near the Royal Shakespeare Theatre, at 11am Monday, Tuesday, and Wednesday, and at 2pm on Thursday, Friday, Saturday and Sunday. There is a charge of £5 for adults and £2 for children. The road beyond is called Bridge Street, and leads up into the town. Bridge Street is lined with shops, including many clothes shops. Some people visit Stratford just to do shopping. There are several courtyards and passages, with shops and cafes around Stratford. 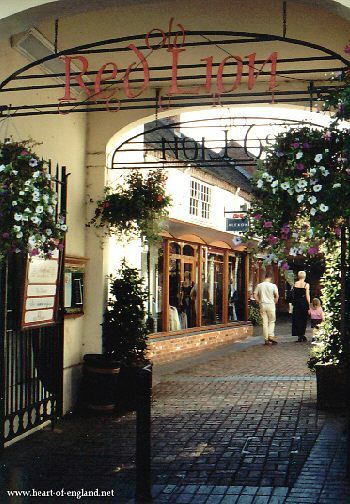 This is Red Lion Court, off Bridge Street. 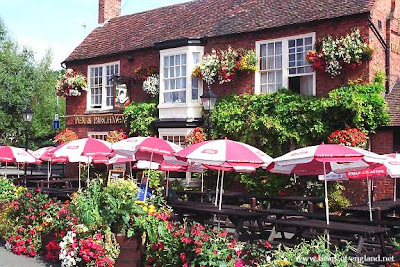 There are numerous establishments offering refreshments throughout Stratford. This is the attractive Pen and Parchment at the bottom of Bridge Street. At the top of Bridge Street is a traffic island. The road off to the left is High Street, and we shall come back to explore that later. 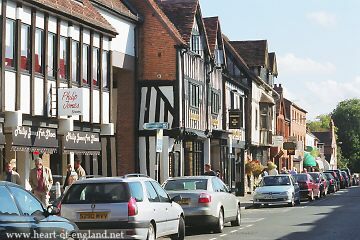 The road off to the centre right, is Henley Street, shown here, with Shakespeare's Birthplace near its far end. 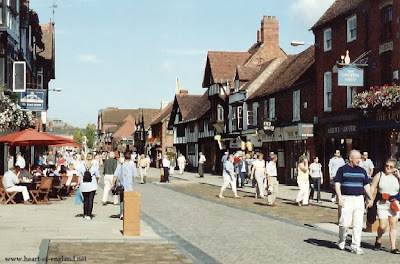 There is restricted traffic in Henley Street, and a high concentration of souvenir shops. Henley Street is called Henley Street because it was the road to Henley-in-Arden, in the heart of the Forest of Arden. Another view, a little further down Henley Street. The half-timbered black and white building at the right is Stratford Library. The red brick building in the centre is a Gift Shop operated by the Shakespeare Bithplace Trust. 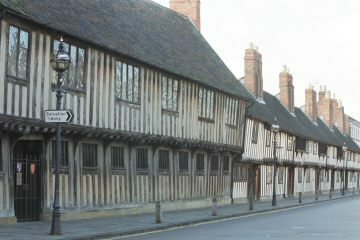 The building just beyond the gift shop is Shakespeare's Birthplace. This is Shakespeare's Birthplace, in Henley Street, and just beyond it is the Shakespeare Centre which houses various Shakespeare exhibits. Directly opposite the Birthplace is the Shakespeare Bookshop. They have most editions of the plays, books of criticism, videos, and books about Tudor history. But they don't have any rare or second hand books. There are a couple of national chain stores, selling much the same books as in any other town in England. The main bookshop specialising in Shakespeare is The Shakespeare Bookshop, which is directly opposite Shakespeare's birthplace in Henley Street. They have most editions of the plays, books of criticism, videos, and books about Tudor history. But they don't have any rare or second hand books. They will supply books by mail order. You can E-mail them at The Shakespeare Bookshop. There are also 3 antiquarian and second-hand booksellers in Stratford. The Chaucer Head Bookshop in Chapel Street, immediately next door to Nash's House, is a general second-hand bookshop, and has a substantial Shakespearean section. Immediately next door, on the other side to Nash's House, is Robert Vaughan Antiquarian Booksellers, specialising in Shakespeareana, as well as theatre and other performing arts. 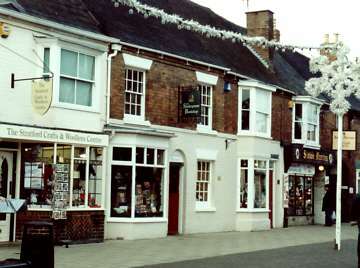 And there is also the Stratford Bookshop, another general second-hand bookshop, in Rother Street. The Shakespeare Bookshop also has a collection of souvenir postcards of well known Shakespearian actors who have played at Stratford. Continuing on up Henley Street, and turning left along Windsor Street, we come to the Market Place. The gothic monument is called the American Fountain, the gift of George Childs of Philadelphia, to Stratford, in Queen Victoria's Golden Jubilee Year. On each corner of the fountain are lions and eagles, representing Great Britain and the United States. A road off the Market Place leads to Stratford Station. The railway line between Stratford-upon-Avon and Birmingham runs through what used to be the Forest of Arden. 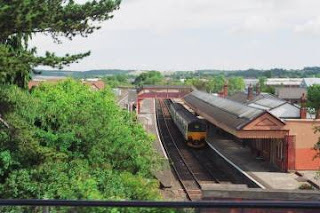 This railway provides a convenient way for visitors who don't have a car to see the Forest of Arden area, and also to visit several interesting places. The railway runs close to the A34 Stratford to Birmingham road, so if you have a car, then you can simply drive along the road through these places. 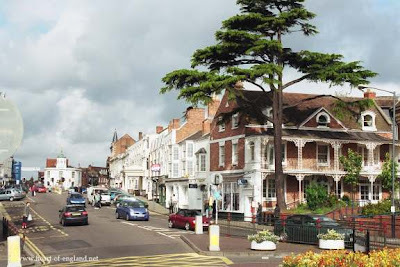 The train calls at Wilmcote, Wootton Wawen, Henley-in-Arden, Danzey (near Tanworth-in-Arden), Earlswood (an area of lakes surrounded by ancient woodlands), Hall Green (within easy walking distance of Sarehole Mill and the childhood home of J R Tolkien), and then into Bimingham. There are trains in both directions, every hour. Exploring the Forest of Arden Area by Train. On Sundays, during the Summer, there is an additional service hauled by steam locomotives, but this is less frequent and more expensive than the regular service. 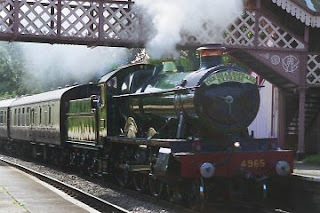 This picture shows the Shakespeare Express passing through Wilmcote station. Cycling provides another convenient way for the independent traveller to see the surrounding area. In addition to public roads, canal towpaths provide useful cycleways. It's an easy journey from the Stratford Canal Basin along the Stratford Canal towpath to Mary Arden's House (or it's a very long walk). Some very picturesque countryside and small villages can be reached from the Stratford Canal, beyond Mary Arden's House. Visitors can hire a bike from Stratford Bike Hire (£13 per day). Also in the Market Place is the White Swan, a former coaching inn, and now a hotel. Continuing our walk, from the Market Place, taking the road to the left out of the Market Place, Wood Street, takes us back to the traffic island, at the top of Bridge Street. Many local bus services leave from Wood Street, for those who want to explore the region. 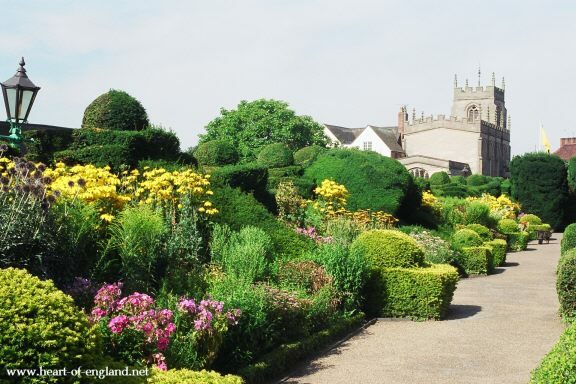 The X16 bus service provides a convenient way to visit the other main tourist attractions in Warwickshire, of Warwick Castle, Kenilworth Castle, and Coventry. There are many popular and attractive locations around Stratford, within easy reach by car or local bus services. These include Warwick Castle and Kenilworth Castle, Charlecote Park, the charming towns of Henley-in-Arden, Bidford on Avon and Chipping Campden, and the villages of Ilmington and Welford-on-Avon. 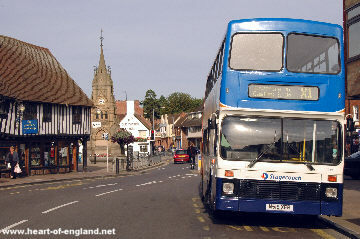 Details of all local bus services can be found at West Midlands Bus Time Tables. A handy pocket-sized map showing all bus services throughout Warwickshire, and printed time-tables, are available in the Stratford Tourist Information Center (see top of this page). 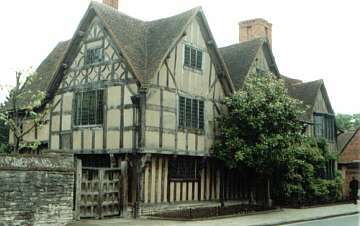 Two out-of-town properties owned by the Shakespeare Birthplace Trust are Anne Hathaway's Cottage in Shottery, and Mary Arden's House (Shakespeare's mother's home) at Wilmcote. 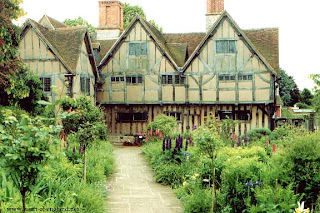 Anne Hathaway's Cottage is about one mile from Stratford. There is a well-signposted footpath from Stratford to Anne Hathaway's Cottage, which is illustrated here: Walk to Anne Hathaway's Cottage. That page also includes some pictures of Anne Hathaway's Cottage. 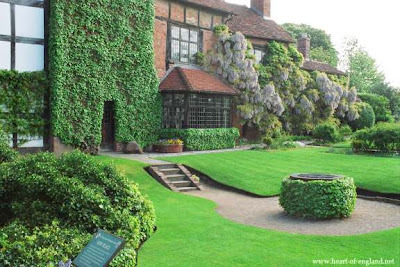 Mary Arden's house is probably the least well known of all the Shakespeare houses, but one of the most interesting to visit. It comprises two complete farms, with numerous attractive outbuildings and many rural exhibits. 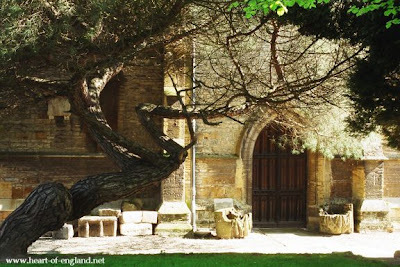 There are more pictures of the attractions at Mary Arden's House on the Mary Arden's House page. 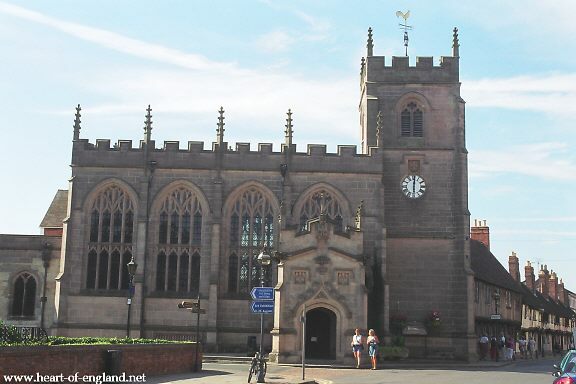 Wilmcote is 3 miles from Stratford. An easy way to get to Wilmcote is on the train (see Exploring the Forest of Arden Area by Train). 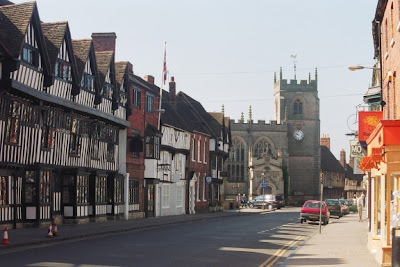 Several other villages in Warwickshire which have connections with the Shakespeare family are described here: Shakespeare's Roots (though those villages may not be easy to get to by public transport). 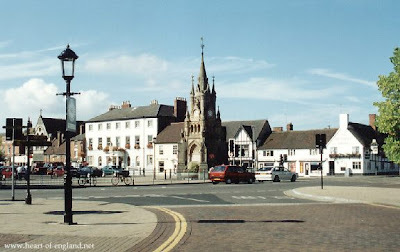 At the traffic island, we turn right, along High Street. There are many notable buildings along both sides of High Street, and its continuations, Chapel Street and Church Street. 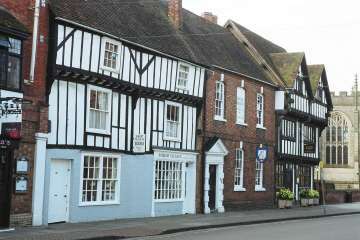 This is the Garrick Inn (left centre) and Harvard House (right centre). 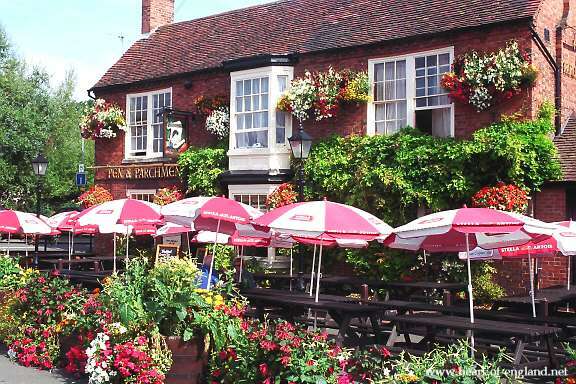 The Garrick Inn is named after the Shakesperian actor David Garrick. Opposite the Garrick Inn and Harvard House is Sheep Street. 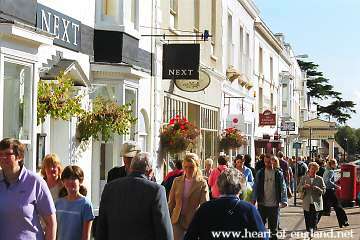 This picture shows the view looking down Sheep Street. 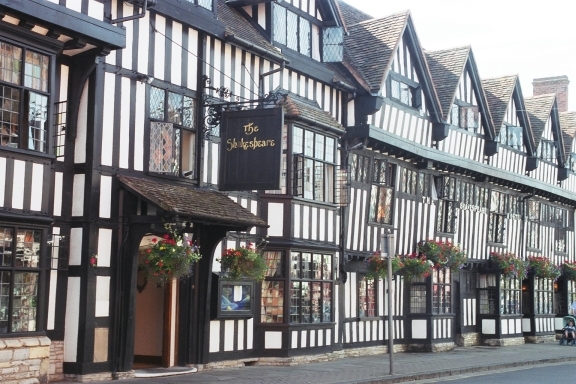 This is the impressive Tudor front of the Shakespeare Hotel. Just beyond the Shakespeare Hotel, are Robert Vaughan's Antiquarian Booksellers, The Chaucer Head Bookshop, and beyond that is Nash's House. Robert Vaughan Antiquarian Booksellers, specialises in Shakespeareana, as well as theatre and other performing arts. The Chaucer Head Bookshop, immediately next door to Nash's House, is a general second-hand bookshop, and has a substantial Shakespearean section. This is Nash's House, owned by the Shakespeare Birthplace Trust, and furnished inside to give the best possible idea of Shakespeare's own home, which was formerly next door. Nash's House is now furnished inside to give a good idea of what Shakespeare's own home would have been like. This is New Place, next door to Nash's House, and formerly the site of Shakespeare's home. You can look over a low wall to see this part of the site. There is a large garden at the rear of New Place. The part nearest to the former house is accessed through Nash's House. But the larger part of the garden, the Great Garden, shown here, can be entered (free) through a gate down the side road. Moving on past New Place, we next come to the Guild Chapel, and just beyond that the schoolroom (shown also in the next photo) is just visible. 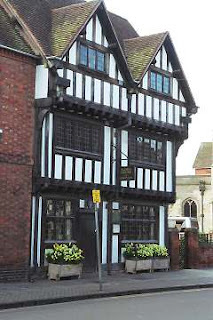 This is the Old Grammar School, where Shakespeare went to school. The school was built in 1428 as the home of a religious guild. 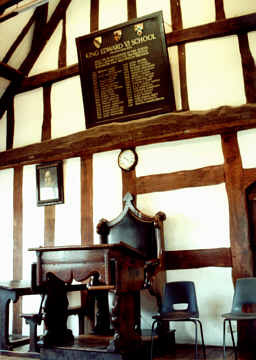 The lower floor of the building is a meeting room, and the schoolroom itself is on the upper floor. The schoolroom is only open to visitors on rare occasions. 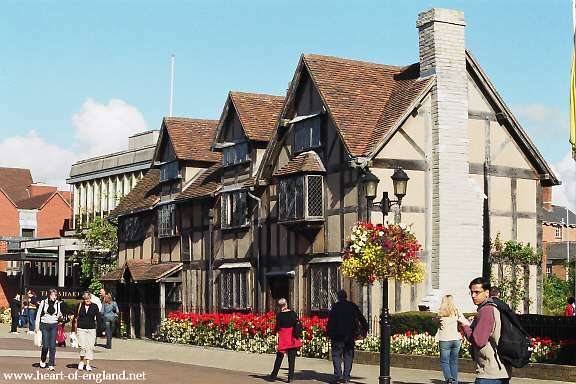 It is often open for the Shakespeare's Birthday celebrations, held in Stratford each year, usually on the Saturday nearest to 23rd April. These pictures show the inside of the schoolroom in which Shakespeare studied. The curriculum was mainly based on Latin, studying such authors as Virgil and Ovid. The curriculum would also have included some Greek, probably Homer. 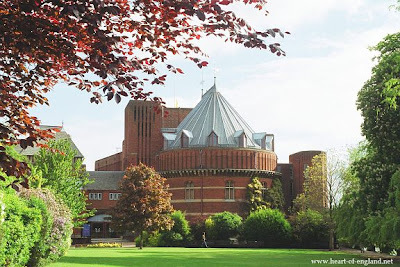 Today this building is part of the King Edward VI Grammar School. 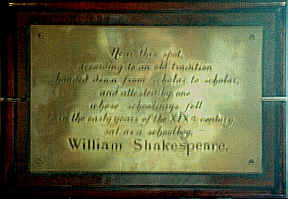 This plaque on the schoolroom wall states that Shakespeare studied in this room. Here is the desk where Shakespeare's teacher sat. This teacher passed on his own love of Ovid, Virgil and Homer to young William, and thereby laid the foundation for Shakespeare's great work. At the end of the street, we turn left, down a road called Old Town, and the site of Hall's Croft. 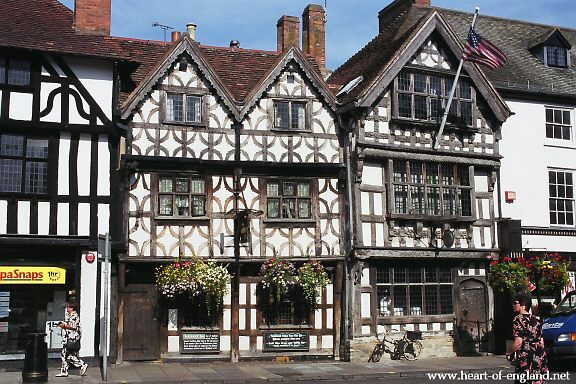 This was the home of Shakespeare's daughter Susanna, married to Dr John Hall. John Hall was a doctor, and exhibits in the house include a gruesome display of medieval medical instruments. There is also a large and attractive garden behind the house (photo right). 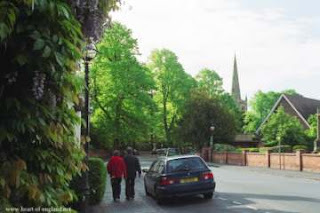 Proceeding down Old Town road, we can see the spire of Holy Trinity Church ahead. The parish register within the church holds the records referring to Shakespeare's baptism and his death. 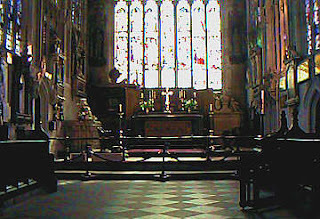 They are exhibited in a glass case in the chancel (the part of the church near the altar). The case holds two documents, shown in this picture. The document at the left is the page of the parish register which includes the entry for Shakespeare's baptism, and the one at the right is the page containing the entry for his death. 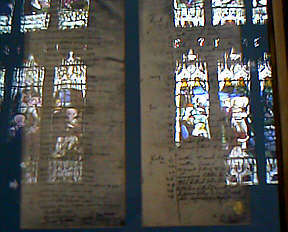 The stained glass windows are reflected in the glass of the document case. Shakespeare is buried in the chancel of this beautiful church. 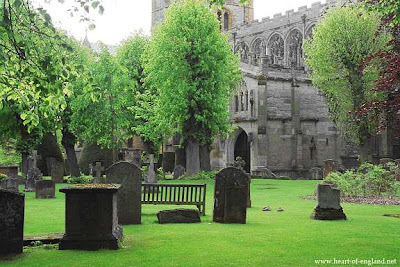 Anne Hathaway, his wife, and his daughter, Susanna, lie in graves either side of him. The S in this picture shows the precise location where he is. Anne Hathaway lies on the left side, and Susanna on the right. The G indicates a statue of St George, watching over Shakespeare. We visited the tomb of the mighty wizard. What a magic does the locality possess. There are stately monuments of forgotten families, but when you have seen Shakespeare's what care have we for the rest. 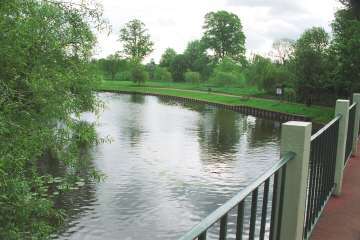 One alternative is to walk back along on the same side of the Avon. This takes us past the entrances to the theatres, and is possibly the route of more interest to theatre lovers. (Alternatively, we can return via the river route, which is described further down the page). There are 3 principal theatres. 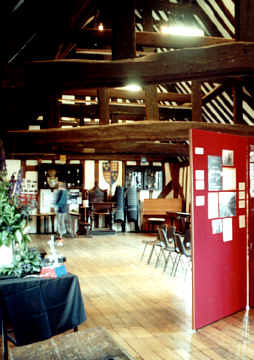 The first one we come to is The Other Place, used for non-Shakespearian performances. The Swan Theatre, built in the style of an Elizabethan Round House, and the Royal Memorial Theatre are on the opposite side of the road, and shown below. This is the Swan Theatre. And around the other side is the main entrance to the Royal Memorial Theatre. The alternative route back is to cross over the Avon and proceed back along the opposite bank, this route gives us a better view of Holy Trinity Church. To cross the Avon, follow the road from Holy Trinity Church a little further on away from the town. The road narrows into a footpath, and leads to a footbridge over the Avon. Returning on the opposite bank gives some good views of Holy Trinity Church across the Avon. 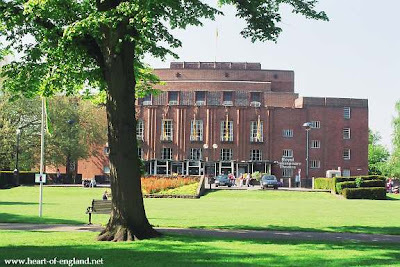 And we then come to the Royal Memorial Theatre. Swans sometimes like to gather on this bank. There are 2 bridges back: another footbridge, and the Clopton Bridge, which carries the main road. This picture shows the footbridge, which we reach first. This is called the Tramway Bridge, and formerly carried a tramway. Before returning over the tramway bridge we have a good view of the Clopton Bridge beyond it. The name Stratford means street-ford. In Roman times this was a crossing point, a ford, over the Avon. 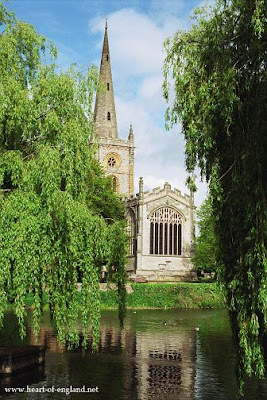 There are many Stratfords and Stretfords in England (Stratford Gloucestershire, Fenny Stratford, Stoney Stratford, Water Stratford, Stratford Langbourne, Stratford le Bow, Old Stratford, Stratford St Andrew, Stratford St Mary, Stratford sub Castle, Stratford Toney, Stratford-upon-Avon, and 2 Stetfords). They are all located at points where old Roman roads cross rivers. 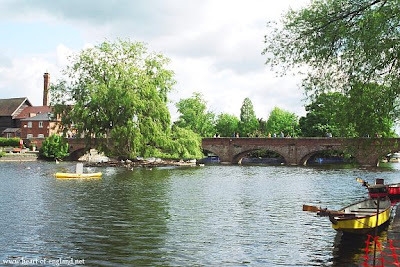 The Roman road that crossed the Avon at Stratford-upon-Avon was the Salt Road to Alcester (the modern A422). 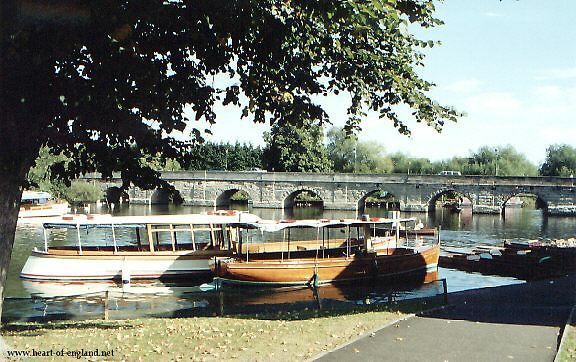 In medieval times a wooden bridge was built, alongside the ford, and at the end of the fifteenth century the stone bridge shown here was constructed. We are now back near the Gower Memorial with the statue of William Shakespeare, and the Canal Basin. 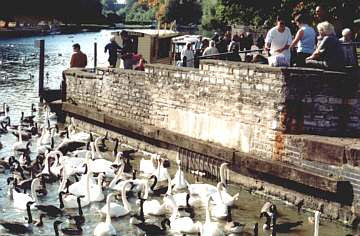 This is a favourite spot for tourists to throw bread to the swans. This is also the place where the Stratford-upon-Avon Canal joins the River Avon. 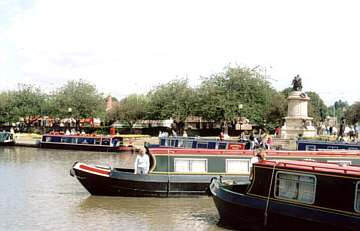 This picture shows the Stratford Canal Basin. In the right background of the picture is the Gower Memorial.